Functional medicine is patient centered in a way that you’ve never experienced before. Instead of looking at and trying to heal individual health problems as isolated diseases, it looks at the individual as a whole and addresses bodily symptoms, imbalances, and dysfunctions in their entirety together. 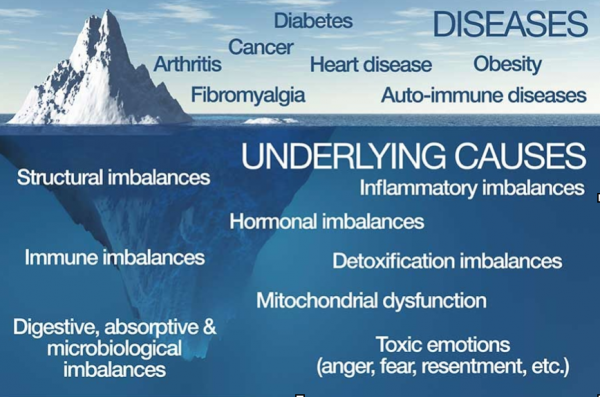 While traditional health care will often address the disease once it is visible, it fails to take a look at the altered physiology below the surface that is often building up the problem. The question to ask yourself is why doesn’t the old model work? Because chronic disease is a food and lifestyle driven, environment and genetics influenced phenomenon. It won’t be conquered with drugs and surgery, however helpful these tools may be in managing acute symptoms. There is no surgery for diabetes, thyroid imbalances, Alzheimer’s, and so many other chronic diseases. Instead, it’s time to look beyond the traditional approach that isn’t working. And that’s where the Functional Health Institute comes in. We focus on the patient and not the disease. We don’t aim to mask your symptoms or explain away your illness. With the use of extensive science based testing, we work comprehensively to uncover the root cause of your illness and restore your health to optimal functioning. We help YOU to become truly healthy.